Upon the occasion of Gallery Weekend, I am pleased to announce a presentation of new works at the studio, which will be open (scheduled by appointment) from Friday 26th - Sunday 28th April. If you are in town, it would be my utmost pleasure to personally welcome you here. Galerie ISA is pleased to present at India Art Fair a group exhibition that brings together a dynamic combination of works by: Diana Al-hadid, Edouard Baribeaud, Matthias Bitzer, Robert Elfgen, Gregor Hildebrandt, Idris Kahn, Annie Morris, Michael Kunze, Alicja Kwade, Marin Majic, Annie Morris, Radu Oreian, Antonio Santin, Joseph Tong and Hugo Wilson. Press release courtesy Galerie Isa. 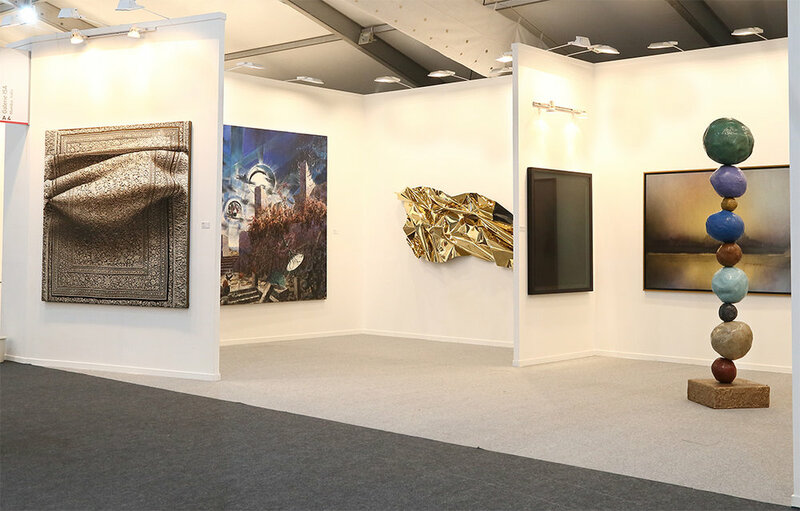 Galerie ISA is excited to present at Abu Dhabi Art Fair a group exhibition that brings together a dynamic combination of works by: Idris Kahn (OBE), Annie Morris, Robert Elfgen, Antonio Santin, Joseph Tong and Aldo Chaparro. It is the first exhibition of his recent works in Munich. The artist, born 1981, lives and works in Berlin and has shown internationally, including Hong Kong, Mumbai and Berlin. The exhibition includes a selection of works from recent series: Anthropocene, Remembrance of Realms Past, Strata Obscura and Tabula Rasa. Gestural strokes of calligraphic ink fused with the inertia of paint upon white canvases share both complimentary and frictional qualities in Anthropocene. Varying in weight and thickness, the energetic marks expel across the surface in various directions. Spontaneous expressions and visual articulations generate deliberate patterns, forms and expanses of monochromatic colour within an orderless composition. The expressive mark-making and frenzied strokes form a loose and gestural aesthetic, yet rooted in calculated exactitude in advancing the visual narrative. Remembrance of Realms Past explores the boundaries which envelop the relationship between the artist's hand and the attempt to instantiate the natural world, where depictions of nature are not presented as mere representations of the external world but rather the ideology of nature. These works become a window to an imagined space rather than as a sculptural / pictorial element. From this space, the landscape of each painting - coaxing from this organic foundation the development of a myriad of ornamental forms - coalesce into compositions that appear as an object for the viewer's mind, rather than as an open window for the viewer's eye. In Strata Obscura, the immersive and illusory narrative of the works allude to an earlier series L'apparition, where perceptions of dimensionally fluid and malleable visual contexts are examined. The works' primary concerns include the effects of colour as light, shadow as dimensionally formal structures, and thus engages the viewer to a certain dualistic aesthetic. 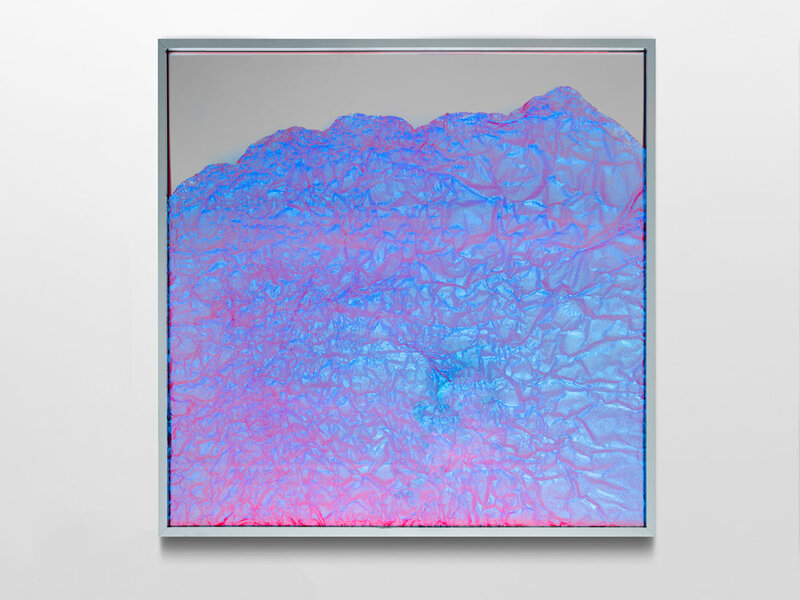 Beneath the dichroic surface the unexposed topographical element (composed of industrial aluminium) succumbs to colour changes and visual variations. The elemental structure - reminiscent of stratum - becomes obscured as it adheres to the interplay of form, light, and setting. Relying on the reflective capacities, the solid structure underlying each work seem to dematerialise (depending on the viewer's perception / viewpoint). 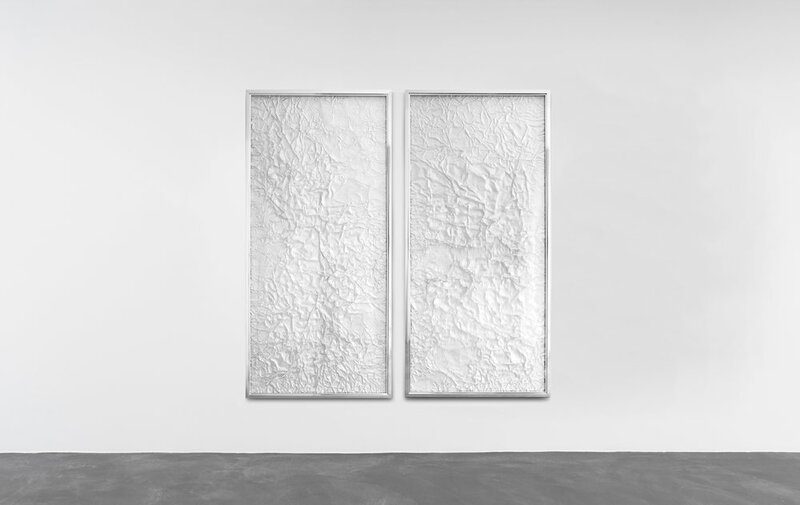 Two works from the series, Tabula Rasa, bring opposing principles that are subject to both cogitation and negation. Using Chinese calligraphy Xuan paper beneath linear Plexiglas; both materials become subliminal references to the mind (that at birth the mind is a "blank slate" without rules for processing data, and that data is added and rules for processing are formed solely by one's sensory experiences). The paper, like the mind, awaits the calligrapher’s hand to engrave cognisance onto its blank surface. The Plexiglas becomes the ‘lens’ that focuses the process of gradual or unconscious assimilation of ideas – yet to be imprinted. 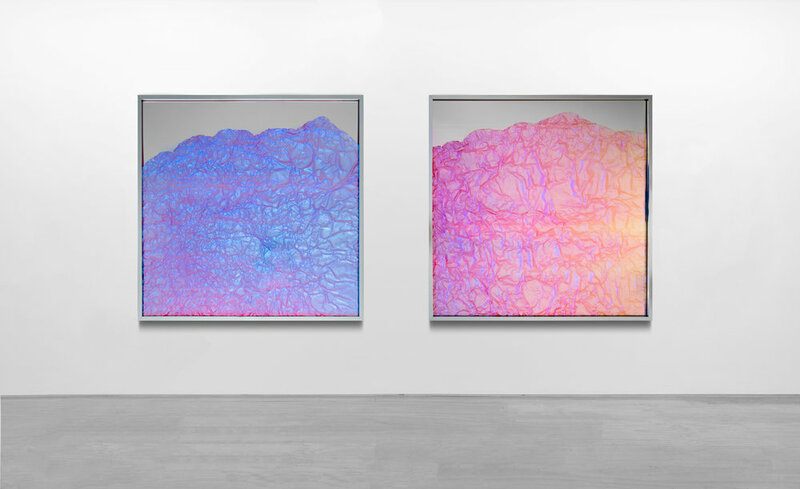 Sheets of aluminium foil and dichroic film dominate equally in this series. Whilst the calligraphy paper becomes the metaphor for a mind that absorbs, the reflective nature of the foil and the colour variations of the dichroic film symbolise an alternative conduit for cognition. Press release courtesy of IAM. Upon the occasion of Berlin Gallery Weekend, I am pleased to announce the opening of my new studio located at Lehrterstrasse 57 with a presentation of new works. If you are in town, it would be my utmost pleasure to welcome you here! Galerie ISA is excited to present at India Art Fair a group exhibition that brings together a dynamic combination of works by: Christian Achenbach, Edouard Baribeaud, Aldo Chaparro, Robert Elfgen, Joseph Tong, Idris Kahn, Annie Morris, Diana Al-hadid and Michael Kunze. Galerie ISA is delighted to present 'Shaping Space', a group exhibition that brings together a dynamic combination of works by: Christian Achenbach, Edouard Baribeaud, Aldo Chaparro, Robert Elfgen, Olafur Eliasson, Martin Kobe, Anselm Reyle and Joseph Tong. 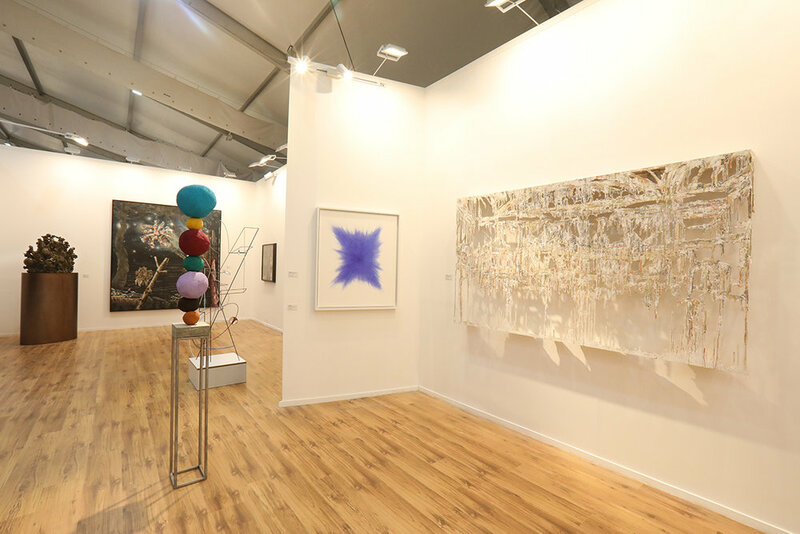 As the title suggests, all the artists in the exhibition are engaged with either the metaphysical notion of space and how to translate it, or with its physical manipulation, be it through painting, sculpture, works on paper and even light. Man's relationship to space has had a pivotal role in the evolution of societies across the world and our understanding of space and our interactions with each other, via space, have arguably never been more crucial as a topic for investigation. Indeed the very word 'space' conjures up the idea of exploration. Now though, the word 'space' more often leads us via our imaginations beyond our own planet, into the far reaches of the solar system. Still though the word remains an emotive and even a politicised concept. There are already legal battles in place over who owns space, and, closer to home, we defend our own sense of space and even talk in military terms about the 'invasion' of our own 'personal' space or about protecting our 'time and space' - neither of which are actually physical, yet, like the wind we feel more aware of both when they are in some way diminished or augmented. Space then is an inspiring concept: something to dream about, to seek to conquer and to defend. Not surprising then that it has captivated artists for generations and that it is no less valid now. We cannot help but think about space as soon as we are confronted by the paintings and sculptures of Christian Achenbach (b.1978 in Siegen, Germany). Exploding with a riot of colour they have been described as being at the crossroads of 'sight, sound, colour and shape'. They are as playful and engaging as the landscapes of Robert Elfgen (b.1972 in Wesseling am Rhein, Germany) are sublime and ethereal, capturing as they do the elusive notion of endless, unbroken vistas and dreamy far off horizons. Edouard Baribeaud (b.1984 in Paris, France) draws us into a very different kind of space where the archaic meets the mythical and the folkloric is elevated to the grandest of designs. Baribeaud's fine drawings translate into theatrical visions which entice the viewer into a land of fantastic and characterful imaginings. If Baribeaud and Elfgen are about elusive or far away spaces, then Aldo Chaparro (b.1965 in Lima, Peru) provides us with a strong jolt of tangible physicality. Best known for his sculptures shaped from stainless steel, the artist also works across multifarious disciplines including music, industrial design, editing and writing. His practice is all about revising and remixing - the elusive space between something ending and something else beginning, but his sculptures remind us that even when things are in a state of flux, something concrete can still be created or left behind. Olafur Eliasson (b.1967 in Copenhagen, Denmark) has created sculptures and large-scale installations using elemental materials such as light, water and air in addition to more traditional art materials. He describes his studio as a laboratory for spatial research, unsurprising considering that this is an artist who has always been fascinated with how we as physical beings engage with space, and thus go on to shape the world around us. Martin Kobe's (b.1973 in Dresden, Germany) energetic and dynamic paintings depict complex architectural compositions that simultaneously appear to be heading towards completion while paradoxically deconstructing. They conjure up visions of modernist utopian fantasies - spaces that would surely have filled Corbusier's dreams - but trace each line from its point of origin to its end and it becomes apparent that they are splintering into infinity, marking a line in the sky for a while, rather than colonising or laying claim. Anselm Reyle (b.1970 in Tübingen Germany) has purloined extensively from the 'trademarks of the modernist canon', seeking to bring new life to found objects, and exploring and exploiting unconventional materials such as Mylar foil or mirrors in order to push at the boundaries of both painting and sculpture. His is a space though that also hovers at the borders of cliche and good taste. Often provocative and confrontational he has chosen to defy and take risks rather than pay homage to his artistic 'fathers'. Joseph Tong (b.1981 in Hong Kong, China) creates conceptual works through a multidisciplinary approach and a variety of media, which includes the elements of oil and ink painting, sculpture, photography, site-specific installation and media art that examine core concepts of the physical reality, whilst exploring notions of alternative reality and dimensional potentialities. 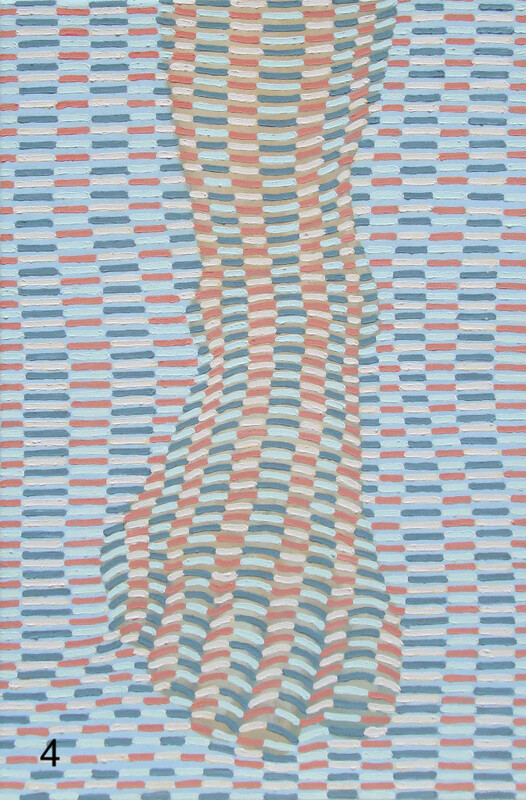 At times, juxtaposing various theories, genres and processes within the confines of a single work, utilising geometric shapes and organic forms as the principal components of abstraction. A visual linguist, Tong uses and combines highly aestheticised materials – such as structured Plexiglas, dichroic film, Chinese calligraphy paper, and Latex. His interactive works challenge the traditional notion of the passive viewer, achieving a sense of tension between viewer and the work itself. 'Shaping Space' - like its diverse combination of artists and its title - promises a kaleidoscopic and colourful examination of a singularly relevant topic. Each angle is different, each position reflects a unique perspective - but all are all brought together in one multi-faceted exhibition. Neues von bekannten Künstlern: Anna Ingerfurth, Andreas Lau, Amely Spötzl, Joseph Tong, Anne-Sophie Tschiegg, Reinhard Voss, Xuan Wang und andere. Wir laden Sie und Ihre Freunde herzlich ein, den nahenden Frühling mit einer Ausstellung neuer Werke der Künstler unserer Galerie zu begrüßen. Incorporating the works of Chris Wood, Joseph C.L. Tong, Katrin Fridriks, Karl Heinz Ströhle, Esther Naor and Thomas Canto, O Gallery presents an investigation of the infinite possibilities of perceiving light, colour, form and repetition. Interpreting the conditions of duality between monochrome and colour, light and shadow, kinetic and static, these installations create shifting visuals that invite viewer participation and broaden established perceptions of art. Upon entering the booth, Joseph C. L. Tong’s radiant Plexiglass works reflect multicoloured shadows on the floor beneath. From each direction the surface appears to alter and shift, treading the line between painting, sculpture and installation. Exploring the impact of variances in light, Tong’s works articulate a striking visual nature that conveys a degree of stability in an otherwise fluid compositional series. Using another variety of optical materials, Chris Wood’s light installation Elliptical Arrangements exploits the aesthetic potential of light by harnessing and ordering its natural and artificial qualities into shifting patterns of colour, shade and materiality. The enclosed installation piece is illuminated by optical projections, casting geometric patterns of colour and texture onto the wall surrounding it. 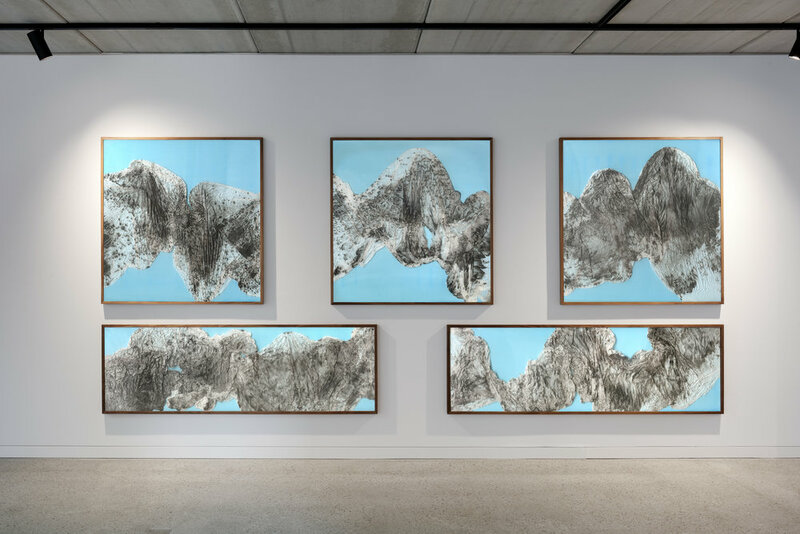 Addressing the complex forces of nature with the controversy of scientific innovation, Fridriks' explosive works are striking in colour and movement. Maintaining a liquid--‐like viscosity on canvas, Fridriks’ abstract paintings constantly appear on the verge of a drip - a change - that is once amorphous and meticulous. Karl-Heinz Stöhle’s monochromatic multimedia works examine line and space through playful minimalism, using spring steel strips to generate seemingly fragile, flexible objects that may react to subtle movements in proximity. In fluid lines StroÅNhle's sculptures are illuminated from the front, casting shadows that communicate a fourth-dimension of spatial awareness. Meticulously engineered with a combination of painted wooden panels, metal cables, Plexiglas and nylon wires, Suspended Horizon appears at first glance to be an arbitrary collection of shape and line. In fact, each line represents a thorough personal study of a moment, place, or experience. Drawing inspirations from memories and impressions of places and people he has encountered, Suspended Horizon demonstrates a surrealist moment in fleeting memory of bustling urban living. In continuation of his work on the relationship between man and architecture, Canto’s installation integrates the rawness of his graffiti style with the fundamentals of Suprematism and Op Art. The geometrics, saturation of light and shadow, and suspended overhang generate an optical illusion that challenges structure and form. With the notable absence of man, viewers should be able to place and navigate themselves in the architecture, interacting with the kinetic effects of the piece. Thomas Canto is a French artist both in 1979. Beginning as a graffiti artist, Canto’s visual language explores an abstract and disorganized entanglement reminiscent of urban life. Incorporating techniques of Japanese printmaking, dynamic calligraphy and structural blue prints into his surrealistic architecture, Canto combines the precision of construction with the splashes and spontaneity of graffiti to depict the random equilibrium of urbanity. 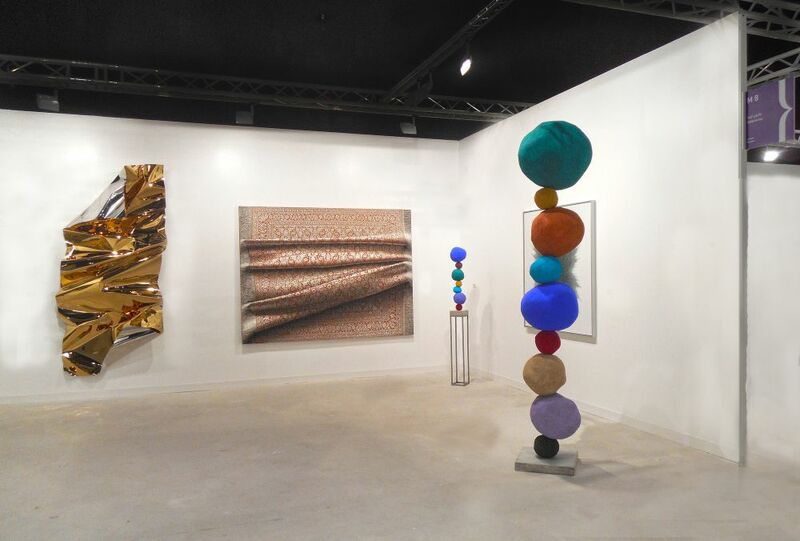 Canto has exhibited in numerous exhibitions worldwide. Recent installations include the K. Live Festival in France, the Outdoor Urban Art Festival in Rome and the Magda Danysz Gallery in Shanghai. K11 Foundation recently commissioned for Canto’s work to be shown at their Collection in Wahan, China. Press release courtesy O Gallery.